This is real simple and you don’t have to be a great cook to whip up some delectable vegetarian food at home. I brought a pack of ready to serve vegetarian food – Pure Vegetarian Asam Fish by Vegetalk. Just to make this dish impressive, I added petai to it. You can choose other vegetable like lady’s finger, egg plant etc if desired. 1. Heat up the pure vegetarian asam fish in wok and set aside. If it too dry, add some water. 2. Heat oil in another wok. Add the petai and fry for 3 mintues. 3. Throw in the petai to the pure vegetarian asam fish. This is real simple and very quick dish. To me, the asparagus look like little green snakes! To my boy, the asparagus is just like a blade of grass that he can stick out from his mouth! I should have cut them into smaller section. 1. Arrange the asparagus in a serving plate and set aside. 2. Heat the oil in a wok or frying pan over medium heat. Stir fry chilli and garlic for 1 minute. Off the heat. Place the chilli and garlic on top of the asparagus. For Lunar New Year, Abalone is a delicacy and a ‘must have’ dish for most of the Chinese family Reunion Dinner (on the Eve of Lunar New Year). Being a vegetarian, does not mean that you need to miss out on the taste of this dish! Of course, NOT! There are vegetarian abalones where we can get easily at most of the Vegetarian Shops in Singapore, which is made using cudlan, starch, wheat straw fiber, condiment and seaweed. 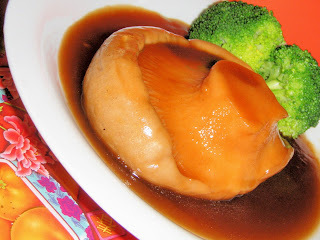 However, using fresh ingredient like Bai Ling Mushroom, which have the same texture and look of a real abalone, we can also easily whip up a simple mock abalone. I purchased one fresh Bai Ling Mushroom at the price of S$2.50 and came up with the below recipe. 1. Combine the ginger, vegetarian oyster sauce, light soy sauce, sugar, sesame oil, water or vegetable stock in a claypot. Mix well and add in bai ling mushroom. Bring to a boil and simmer for 20 - 25 minutes. Flip over the bai ling mushroom after 10 minutes to ensure the upper side is cooked. 2. Lastly, pour in the corn flour solution and off the heat when the gravy thickened. 3. Transfer to a serving dish, garnish with broccoli florets and serves hot. This is a common dish where we can find at the Vegetarian Stall in Food Court or Coffee Shop. You can even add some deep-fried tofu to this dish to make it more nutritious, if desired. Both dried lily buds and black fungus are a good source of iron. 2. Heat oil in a wok. Fry the garlic or ginger for half a minute or until fragrant. 3. Add the lily buds, black fungus, Beijing cabbage and stir fry 2 minutes. Pour in the seasoning and stir-fry for 1-2 minutes. 4. Dish up, garnish with chilli or coriander leaves and serve immediately. This is a simple to do healthy appetizer or salad. You can prepare more in advance and this can used for the stuffing for Kimchi which I can only tried when I get a new camera. 3. Transfer the radish to a big bowl or plate. Throw in all the marinade seasoning and toss well. Leave to marinate for ½ hour and place in the refrigerator till chilled. Sometimes back, I have tried Honeydew Soy Milk Shake with Almond, now I add Almond powder to watermelon juice. It tastes good too. As for the watermelon juice, this is what I did - halve a seedless watermelon and use a tablespoon to scoop out the flesh and throw into a blender (nothing is wasted). Crave for claypot noodle? No problem, it can be easily done in 10 minutes. Here is the simple recipe for it. 1. Combine all seasoning ingredients in a bowl and mix well. Set aside. 2. Place ginger, mushroom and water in a pot. Bring to a boil and simmer for 3 mins. 3. Throw in the cai xin, noodle and seasoning and bring to a boil. Has no idea what to do with zucchini? Besides doing a seasoned zucchini, zucchini pasta, you can also do a simple stir-fry. Replace fresh bamboo shoot with silken tofu, if desired. 2. Heat the oil in a wok. Add the garlic or ginger and fry till fragrant. 3. Throw in the zucchini and bamboo shoot and stir-fry for 2-3 minutes. Season to taste with salt. Pour in the seasoning and stir-fry till the sauce thicken. 4. Transfer to a serving dish, garnish with finely chopped carrot and serve immediately. After having Braised Bitter Gourd with King Oyster Mushroom at Ling Zhi Hi-Tea Buffet, I decide to whip up a simple version of this dish. It tastes nice if you eat bitter gourd which might not be so popular among those who do not like the bitter taste. But I like bitter gourd with chilli. Do you like bitter gourd? 2. Place all the seasoning ingredients in a bowl and mix well. Set aside. 3. Heat the oil in a wok. Add the ginger and dried chilli and fry for 1 minute. 4. Throw in the bitter gourd and stir-fry for 1 minute. Add 125ml of water and simmer for 4-5 minutes or till the water almost dried up. Pour in the seasoning and stir till it thickens. This is incredibly simple, very quick and simple dish to prepare in advance. 1. Blanch the fresh bamboo shoot in a pot of boiling water for 3 minutes. Drain well and set aside to cool for 5 minutes. 2. Transfer the fresh bamboo shoot to a plate. Stir in the sesame oil, light soy sauce and mix well. 3. Sprinkle the sesame seeds and serve. Zucchini Aglio Olio with Curry potatoes! Thanks to Virginie Pean (her lovely blog: Absolutegreen) for leaving a comment on my Seasoned Zucchini recipe, sharing how to make raw zucchini pasta- [extract from her comment: (peeled the whole, so it makes like green pasta) + lemon juice + garlic + olive oil + salt + pepper --> marinated for at least 1 hour]. That gave me the idea for creating this simple recipe. Few days back, I manage to find some yellow zucchini which allow me to test this out. Well, it is lovely, if you love garlic and Pasta Aglio Olio. This can be a good replacement for pasta if you are on a diet or wanting to up fiber intake! You can use olive oil but in here I used the healthy Extra Virgin Cooking Oil (see above picture) which is given to me by my boy’s kind ex-Chinese Teacher - Ms Lim OH, who is a Buddhist Vegetarian. She got it from YES Natural which is just besides The Whole Earth Vegetarian Restaurant . 1. Heat the oil in a wok or frying pan over medium heat. Stir fry chilli and garlic for 1 minute. Off the heat. 2. Add in the zucchini and toss evenly with salt. Serve immediately. So simple and easy to whip up! 2. Add in the baked bean, silken tofu and bring to a boil. 3. Transfer to a serving dish and garnish with spring onion or coriander and serve immediately. Happy New Year everyone, I am back from hibernation and getting back to cooking is a little bit tough after a nice break. So, I tried something simple and it looks like noodle but it is not. It is BaiYe Tofu ( 百 页 豆 腐 )- a traditional Chinese soybean product which is popular in mainland china. It can be used for salad, stir-fried dishes or stew. This BaiYe tofu that I bought is a product of Singapore. 1. Mix the all the ingredients for seasoning in a bowl and set aside. 2. Add in BaiYe tofu. Toss well. 3. Garnish with coriander leaves, sesame seeds and serve.